Chinese Public Security Official Is Elected To Lead Interpol : The Two-Way Meng Hongwei will lead the global police agency. The move could facilitate China's anti-corruption drive, but rights groups worry that Beijing might use the agency to track down political dissidents. Chinese Vice Minister of Public Security Meng Hongwei delivers a campaign speech at the 85th session of the general assembly of the International Criminal Police Organization (Interpol) on Thursday in Bali, Indonesia. A top Chinese police official has been elected president of Interpol, the global police agency. The move could help China with its anti-corruption drive, but rights groups are worried that Beijing might use the organization to track down political dissidents. 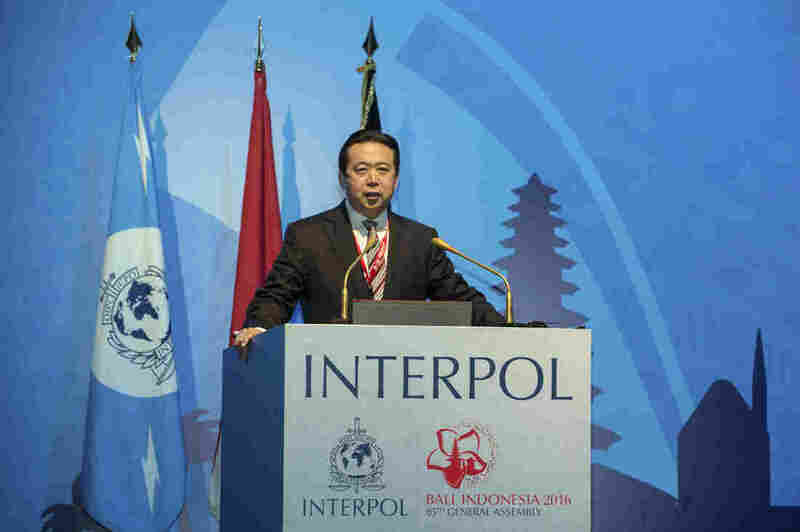 Interpol member countries elected China's vice minister of public security, Meng Hongwei, on Thursday at a general assembly meeting in Bali, Indonesia. "I am a veteran policeman," Meng said during a speech. "And I stand ready to do everything I can towards the cause of policing in the world." "China's sought more international cooperation in tracking down suspected fugitives since Xi Jinping launched the anti-corruption campaign four years ago. Western countries, however, have been reluctant to help because China is often unwilling to provide proof. "In 2014, China issued an international arrest warrant with Interpol for its 100 most wanted corruption suspects overseas. It says it has apprehended a third of them so far." However, "critics have also said Xi's graft crackdown is as much about taking action against his political enemies as it is about going after corruption, accusations the government strongly denies," as Reuters reported. Likewise, Amnesty International's East Asia regional director, Nicholas Bequelin, called Meng's election "extraordinarily worrying given China's longstanding practice of trying to use Interpol to arrest dissidents and refugees abroad." Speaking to the BBC, Bequelin added that "Interpol does not have strong operational power, but it does have considerable influence as the world's largest police organization." Interpol issues red notices, which inform member countries about when a person is wanted for extradition. "I think there needs to be very strong scrutiny of the kind of notices that Interpol is going to issue in respect to Chinese citizens," Bequelin said. Meng will immediately take the reins of Interpol for a four-year term. He will head Interpol's Executive Committee — a body that "provides guidance and direction" to the organization, according to the BBC. "We currently face some of most serious global public security challenges since World War Two," he said during remarks in Bali, adding that the organization should "more effectively promote police cooperation to deliver a decisive blow to this wave of criminality and help build a peaceful and law-abiding world."